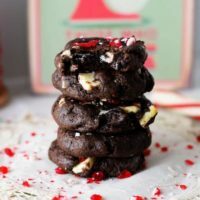 Chocolate Candy Cane Kiss Cookies are pure bliss, a delicious chocolate brownie like cookie, rolled in bright and beautiful sprinkles, and topped with a candy cane kiss. 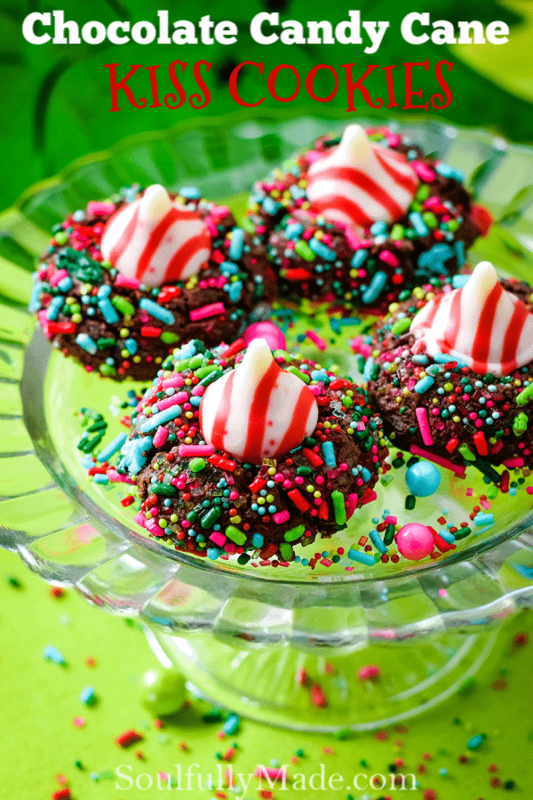 This festive cookie will be a scrumptious addition to any cookie tray! Holiday baking season is the BEST time of year, don’t ya agree? Like Buddy the ELF says “Smiling’s my Favorite”, well, Christmas BAKING is my FAVORITE!! It’s just a time of year that carols are ringing through the air, Hallmark is blasting on the television 24/7, parties galore, shopping, decorating, and spending time with friends and family! I mean what’s not to love!! And on the baking note, CHOCOLATE is also my favorite especially when paired with PEPPERMINT. 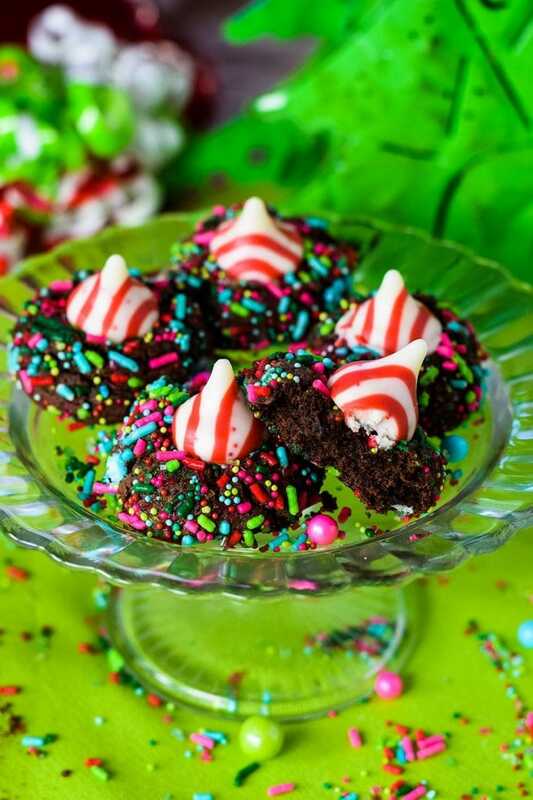 These little cookies are brownie like in texture and not overly sweet on their own, but topped with sprinkles and that glorious candy cane kiss! Y’all they are just the PERFECTION! If you aren’t a big MINT fan, like my husband, don’t go running away! I will give some suggestions for other ways to adorn this cookie below. Now let’s just talk about these bright and beautiful sprinkles the nice folks at SPRINKLE POP sent me to try! They are loads of fun and really baked up beautifully. Head over and take a look at all the amazing options and assortments they offer. 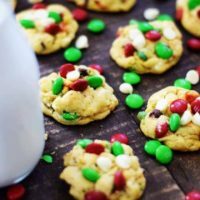 This week is sure to be full of delicious COOKIE recipes, as I am celebrating Christmas Cookie Week along with some of my blogging friends. There is also a great giveaway! So make sure to check all that out below. In standing mixer or large bowl, beat butter and sugar until light and fluffy, about 2 minutes. Add in egg, milk, and vanilla and beat until combined. In another bowl whisk together flour, cocoa, baking soda, and salt. Slowly add flour mixture into the butter mixture and beat until combined. Scrape down sides with spatula if needed. Scoop out 1 Tbsp and form into round cookie dough balls. Roll in sprinkles, if desired, and completely cover dough ball. Repeat until all cookies are done. Place on prepared baking sheet 2 inches apart and bake for 8 to 10 minutes. Remove cookies and gently press candy kiss into center of each cookie. 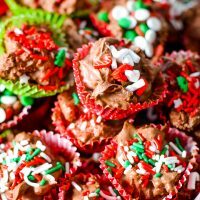 Now some people don’t like mint, so these could be make with a regular, white chocolate, hot cocoa, or any type kiss you love! It can be made without sprinkles as well! I like to make them and drizzle white and semi sweet chocolate over them as well. 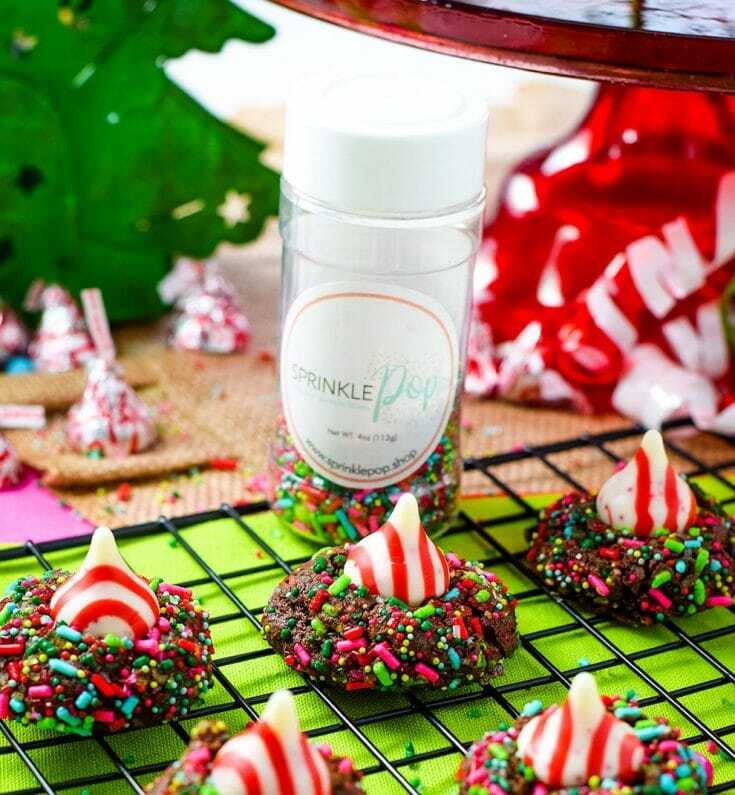 Or melt down some of the candy cane kisses and drizzle over top and sprinkle with some crushed candy canes! Get creative and make these for whatever occasion you need! Red Candy melts would be divine for Valentines Day too! This mixture is very sticky and can be chilled for 1 hour prior to baking if desired. This makes it a little easier to handle. You can omit sprinkles if desired. I just made the cookies with the Fahoo Fores sprinkles. They are adorable! My taste tasters here loved them! Kim, I am so glad you got those sprinkles and are enjoying the cookies. They are so fun and festive! Taste tester approved is what I so love to hear! Merry Christmas to you and your family! 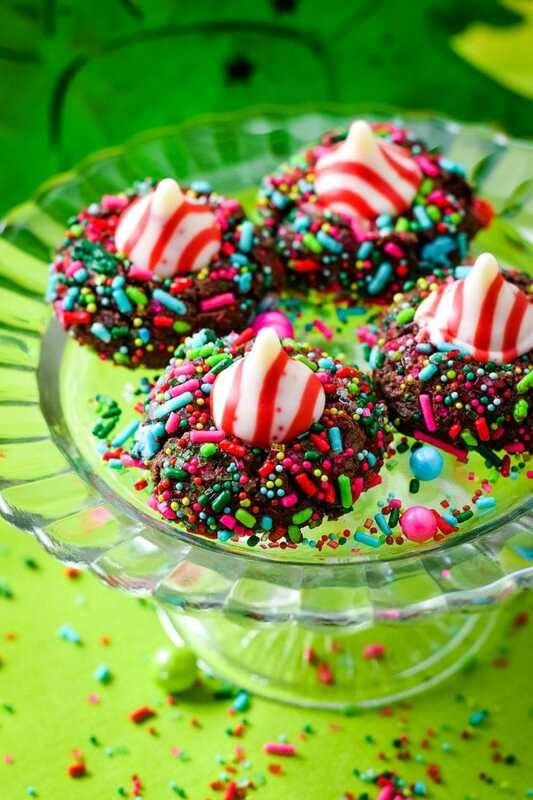 Really cute and festive cookies. I made a version of those for Christmas as well (peanut butter cookie and caramel kisses). Thank you! I love all things colorful! I love the sound of peanut butter and caramel together! A delicious combination! My husband is the cookie Baker and he made these the other day. We love them!! Mary I am so glad you loved them! That means so much coming from such an amazing cook! And you have a gem if he is baking cookies <3! Sounds like you guys are in the Christmas spirit and enjoying the season! Merry Christmas to you and your family! Love how you decorated these kiss cookies! So festive! Thank you Liren! I love bright colors for the Christmas season! These look so festive! I love it! Thank you Toni! I wish you and your family a wonderful Holiday Season! What a fun dessert! These are so perfect for kids and so celebratory!! I love the stripes and chocolate together. So festive! Thank you Cindy! 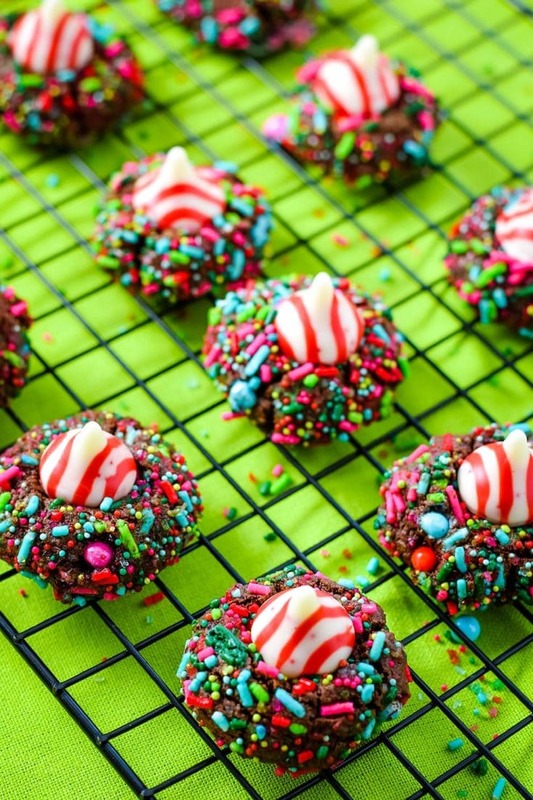 They are a fun and happy cookie for the holidays! 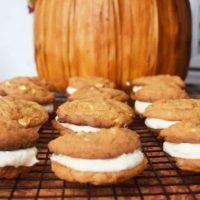 Oatmeal scotchies are my favorite to make, and that is because I eat handfuls of those butterscotch chips.